Hey kids looking for a little adventure? Grab your parents and go diving! If you’re 8 – 9 even 10 years old, the PADI Bubblemaker program is for YOU ! The program will introduce you young thrill seekers to the art of breathing underwater in the SEA or Pool. With a qualified PADI Instructor and in the convenience of a pool or calm body of water. Kids You can take the plunge! 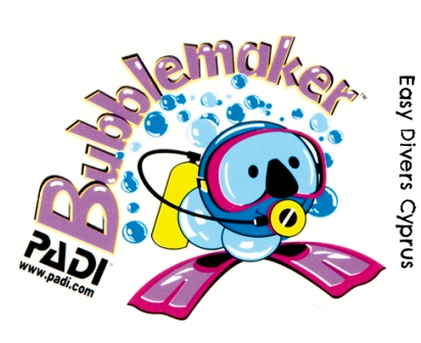 Start out on the right fin, and sign up for PADI’s Bubblemaker program today. It’s a great idea and fun for your next birthday party or just a family thing. Just think, you won’t have to hold your breath underwater anymore. To learn how to breathe in the underwater world like fish or for further information on the Bubblemaker program, drop us a line. Hey kids wanna try SCUBA! It’s fun and very easy! It’s called Bubblemakers. Yes Padi Bubblemakers in Cyprus with Easy Divers. You get to put on a set of real scuba diving equipment and dive with a PADI instructor you will see where Nemo is live in the Ocean. You will get to dive in beautiful, warm and clear waters to a depth of 2 metres normally green bay. We only dive in the sea where there is plenty of marine life to see. You will have a chance in the shallows to practice skill like a real scuba diver. A PADI instructor will show you how to use your diving equipment. The instructor will explain the important rules of diving. You enter the water from the beach to practice bubbling before swimming to the reef to see fishes and coral. You need to be 8 or 9 years old and healthy. You must complete the Bubblemaker statement (provided by your instructor) with your parents. You can join a PADI Seal Team (sorry, we can’t offer you this program since we don’t have a swimming pool). When you are 10 you can continue the diving adventure by taking the Discover Scuba Diving, Junior Padi Scuba Diver Course or Junior Padi Open Water Diver courses. The Bubblemaker Diver cost is €60. This includes the rental of equipment, Instructor and one dive. Additional dives can be added at €45.